From left: FNI researcher Pål W. Skedsmo, Ilkka Pietilä from the University of Tampere, FNI's director Geir Hønneland, FNI researcher Anne-Kristin Jørgensen, Anna Tarasenko and Dmitry Goncharov from the National University Higher School of Economics in St. Petersburg. FNI researchers recently presented key findings from the InstaRuss project at the annual Aleksanteri conference in Helsinki, Finland. The conference, which is organized by the Aleksanteri Institute and The Finnish Centre of Excellence in Russian Studies, was titled “Life and Death in Russia”, and focused on Russian welfare and social policy as well as Russian civil society. 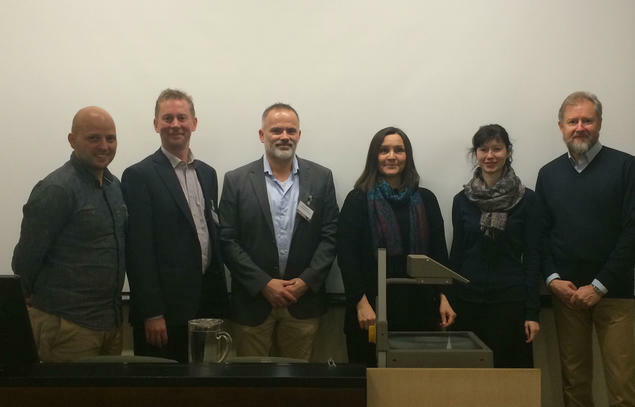 FNI researchers Pål W. Skedsmo and Anne-Kristin Jørgensen both presented research findings at the conference. Together with Dmitry Goncharov from the National Research University Higher School of Economics in Russia, Skedsmo talked about how non-governmental organisations (NGOs) in Russia, faced with the threat of being labelled “foreign agents”, are steering a course between stricter NGO regulations and the risk of their work being politicized. Some Russian activists have “changed tactics” and prefer to avoid the NGO category altogether, organizing themselves instead as social movements adopting creative strategies to do their work and exert influence. “Some of these activists outright denounce NGOs as ineffiecient organizations, and chose to operate in a manner that allows them not to register as NGOs, although this means that they cannot receive funding for projects,” says Skedsmo. Anne-Kristin Jørgensen talked about Russian’s perceptions of bureaucracy and civil servants in various sections of the Russian state apparatus, while researcher Ilkka Pietilä from the University of Tampere in Finland talked about informal practices in navigating Russian health care. In her research, Jørgensen finds that people still seem to have a predominantly negative impression of Russian bureaucracy and “red tape”, but at the same time, the overall picture is improving. The introduction of various e-government systems and multi-functional service centres might serve as a step in the right direction. The research presentations, which were discussed during a panel session led by FNI's director Geir Hønneland, are based on the FNI-led research project InstaRuss. This project examines relations between the individual and the state in Russia from the viewpoint of individuals and NGOs. Through a series of qualitative in-depth interviews, the project investigates citizens' views on the Russian state, their experience with it and the strategies they use in contact with it, particularly in the education, health and welfare sectors.